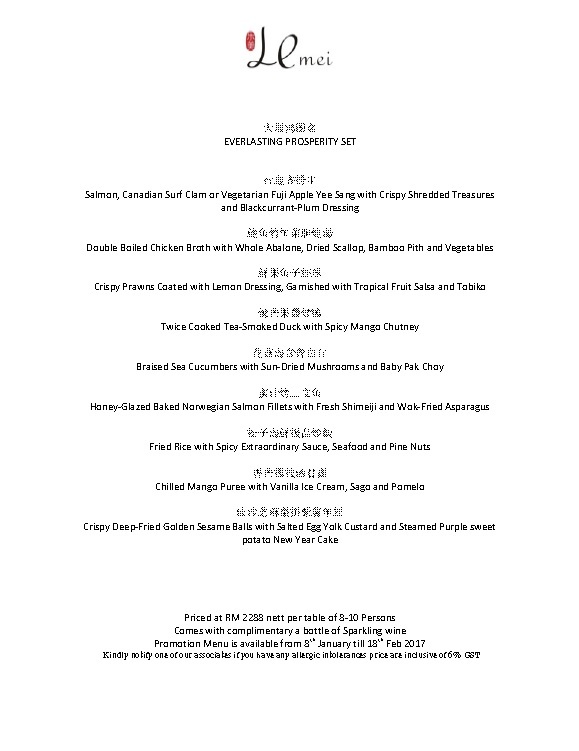 With the festive Chinese New Year celebration in tow, Le Meridien Putrajaya is bringing a feast of Cantonese cuisine to all at Le Mei from 8 January to 18 February, 2017. Chinese New Year is about celebration of togetherness with family and friends and there is no way better to celebrate than to enjoy a gourmet feast of abundance and prosperity together. 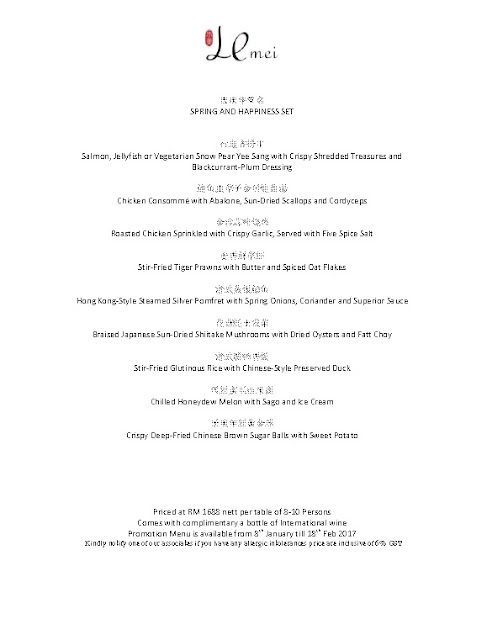 This CNY, Chef Michael Wong and culinary team has whipped up a menu filled with modern Cantonese dishes set in a gorgeous modern and traditional Chinese ambiance. Le Mei seats 158 pax in the main dining room as well as the five private rooms. 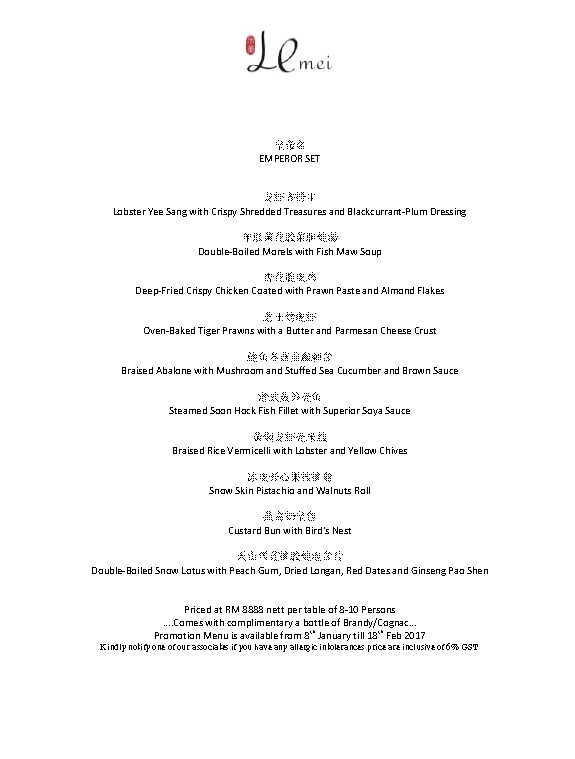 Choose from four menus starting from RM1688nett to RM8888nett with signature creations filled with lots of symbols of abundance and prosperity. Here are the preview of selected dishes from the four menus. Leading the festive meal is the obligatory Yee Sang where a ‘Lou Hei’ is a must for all things auspicious. 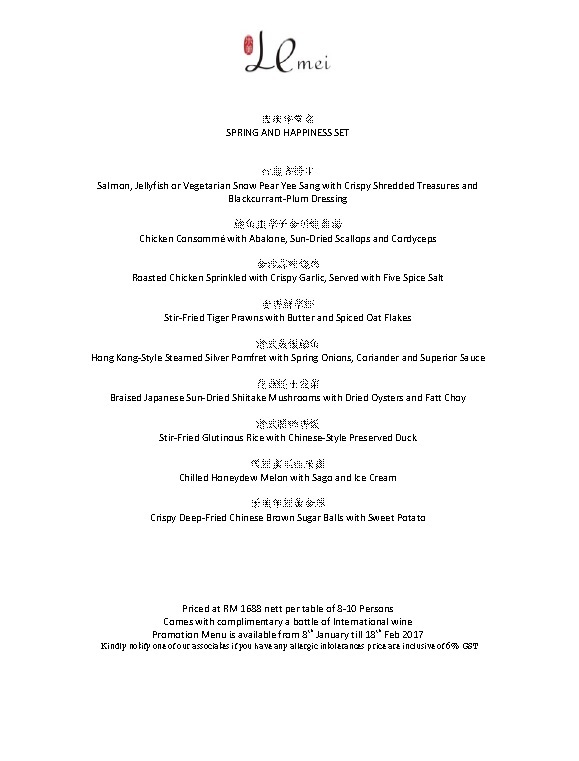 Four Seasons Prosperity Yee Sang features four favorite seafood of Salmon, Tuna, Butterfish and Jelly Fish, served with crispy shredded treasures and blackcurrant plum dressing. The blackcurrant plum dressing is fruity, tangy and a delight to savor. Coupled with all the essential ingredients of the yee sang, tossing and devouring this yee sang is indeed a pleasure. Other yee sang variations include Lobster, Salmon, Jellyfish, Canadian Surf Clam or Tuna Yee Sang, Vegetable Fuji Apple Yee Sang, Vegetarian Snow Pear Yee Sang and Vegetarian Persimmon Yee Sang. Soups are a must and Chef Wong’s Double Boiled Chicken Soup with Whole Abalone, Dried Scallops, Vegetables and Bamboo Pith are soul warming to the core. 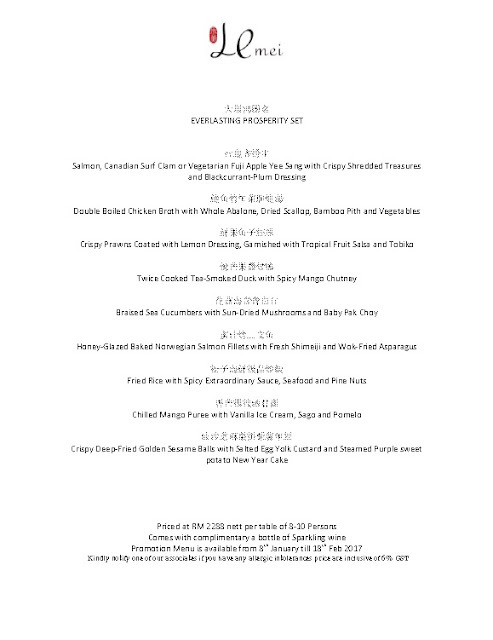 Delicate chicken essence tainted with dried seafood essence are the result of hours of double boiling coupled with premium ingredients. The consommé is beautifully sweet and delicious. Crispy Prawns with Lemon Dressing Garnished with Tropical Fruit Salsa & Tobiko is not just pretty at sight but deliciously creamy and sweet. The prawns are crispy and bouncy, evoking natural sweetness of crustacean lightly coated with a creamy salad and fruity sauce. The bits of fruit salsa added a nice touch of freshness to the prawns. 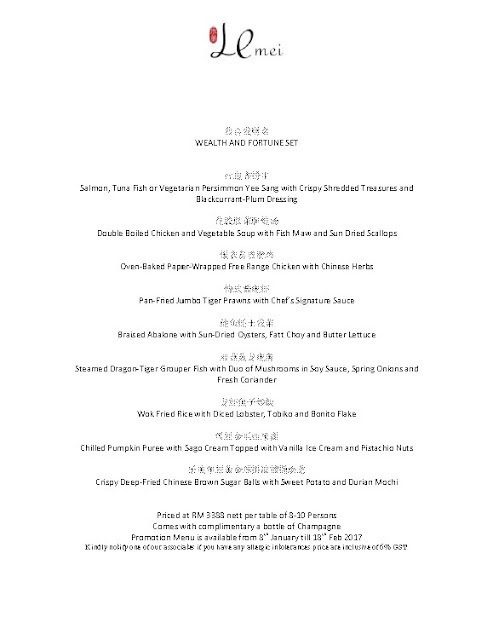 Nothing but the best for this CNY is reflected in the Braised Japanese Sun Dried Scallops, Dried Oysters & Fatt Choy. A sheen of tasty supreme seafood sauce accompanies the premium ingredients braised over hours till tender and flavourful. The crisp bed of greens lifts the richness of the dried seafood well. Taking a unique spin on the fish course is Baked Salmon Fillets with Honey & Onion Rings. Glazed in an unctuous honey sauce, smoked and baked, the salmon is tender and creamy. The sauteed onion rings added a nice texture as well as more sweetness to the fish. To ensure one’s tummy is happily filled, Chef Wong’s Wok Fried Rice with Diced Lobster and Tobiko seals the deal. Turning the classic and ordinary fried rice to a notch of lavishness, small chunks of sweet and tender lobster are studded through the fluffy fried rice. The tiny popping salty tobiko completed the dish with more richness. Dessert is perhaps one of everyone’s favorite course that day. Crispy Deep Fried Golden Sesame Balls with Nian Gao is utterly delicious. Crispy and lightly chewy, the sweet and nutty balls are so good, we wanted more than one. Cool down with a chilled Double Boiled Snow Lotus with Peach Gum, Dried Longan, Red Dates & Ginseng Pao Shen to end the festive meal with sweetness. 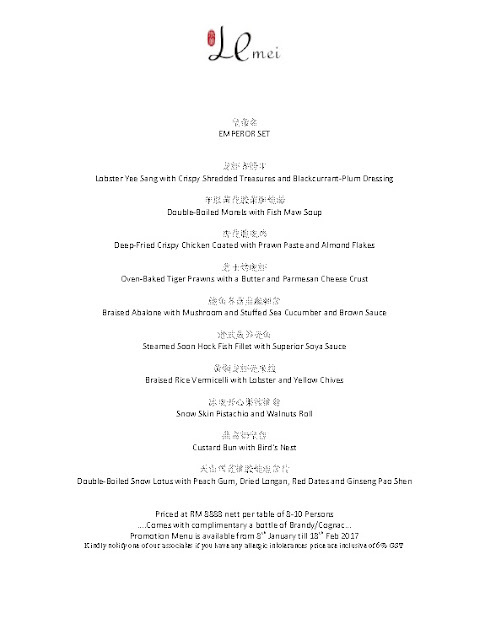 Yee Sang menu starts from RM110 nett onwards.